988 GCMC (Global Chinese Music *something*) Live Musical Party and Concer was an event that held yearly. It had been in Penang for 2 years, last year was at Queensbay Mall and this year was at Auto City, Juru. Still remember last year was raining heavily at the concert and I was not there. This is organized by 988 and is sponsored by Magnum. This was my first time attending such concert. Being so free on the weekend and my brother was still here in Penang, only I got to go to the concert at Auto City. Personally I think that last year’s concert had more interesting singers like Justin and Gary Chao Ge. 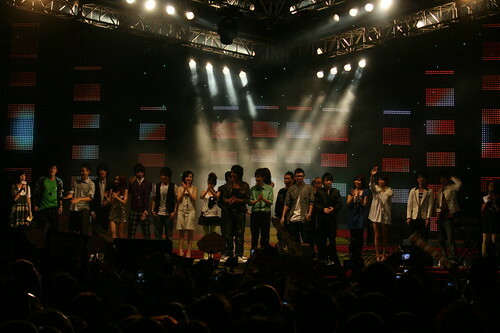 Nevertheless, there’s not one or two overseas artistes but many were here that night. A few of my favourite artistes that night were Yoga Lin, Kenji Wu, Da Zhui Ba (Da Mouth) and Fang Da Tong. Besides that, there were Vincy Yeung and Jason Chen Pak Yu from Hong Kong, Kelly Pan Jia Li from Singapore were there too. As for local artistes, there’s Guang Liang, Fish Leong, Lee Zhi Qing, Manhand (local Cantonese group), Danny Wen, John Huang, Des Chen, Henley Xu. For the first time being at the VVIP or Media Stage, I had to make use of my opportunity to take nice photos. It was actually quite far from the stage, but I get a clear view of everything, though I should have go in front of the stage. However, some turns up to be nice but some not during the little rain in the middle of the concert. The night started off with singing of a medley of popular pop songs by all those local artists. The medley was compose by Manhand, the local Cantonese group. I never heard about them before until I got to this concert. Then, Fish Leong took the stage and start off singing 2 songs from ther latest album. Champion of the first season of the Taiwanese American-idol-liked show, One Million Stars, Yoga Lin turned up after Fish Leong and his fans were going crazy. Seriously, he has a nice voice and I love his singings. Now, I know why everyone favourite him, and so do I.
Danny Wen and Hong Kong newcomer, Jason Chen Pak Yu duet a song together. Actually that song would be perfect if Malaysian Idol Daniel Lee was present because that song was actually sing by 3 of them. Kelly Pan Jia Li is so sweet with her smile. She was the 1st runner-up in the Project Superstar in Singapore which was after the blind Chen Wei Lian who was the champion. It started to rain right after Vincy’s performance. Everyone was busy looking for umbrella and as for VVIP area, every seats got a goodies back which has a plastic rain coat in it. Unfortunately, mine were torn off, I was not worried about me instead, it’s the camera I’m worried of. The rain didn’t last long. Some crowds were moving away from the scene during the rain and surprisingly they were back right after the rain. Glad that I need not to cover my camera with plastic bag because it’s quite difficult for me to shoot at that time. Manhand is really good in freestyle rapping and beat boxing. There’s a session where one of them rap in Cantonese and another beatbox. Everything was so smooth and nice. Da Zhui Ba or Da Mouth rock the stage with their hot dances and songs. Now I know why my friend told me that Da Zhui Ba is hot, especially Aisha, the Japanese girl singer in the group. Fang Da Tong was so shy when asked to dance, when Aisha from Da Zhui Ba took the lead to dance, he also followed with his famous moon-walking. Last session goes off with Kenji Wu and Guang Liang. In the end, they duet a song which was actually written by Kenji and sang by Guang Liang. A guitarist and a keyboard player, the song was Nv Hai Bie Ku 女孩别哭. The concert ends at about 1130pm, encore by almost every singer were done before calling it a day. After encore session, I and MX followed the 988 bus back to G Hotel to join the celebration party. Thank god and finally I get to eat because I only had a milk shake throughout the night. you seriously were on the media area? ?…walau eh..and you follow them back for the celebration..salute sama you..hehe..
but im havin a great moment on tat day oso..
da mouth is cool and hot!!! i missed such big and bex event! argh!! i enjoy it very muc!!!!!!!! OMG!!! how did you get the media pass??? I ALSO WANT!!! aiseh, I cannot call myself avid artiste chaser liao like that.